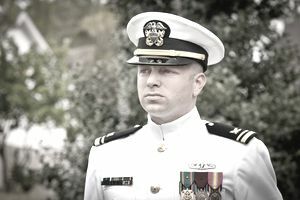 Unrestricted Line Officers are those who are eligible for command of ships, submarines, aircraft squadrons, fleets, and shore bases such as naval bases and naval air stations. These are officers of the line of the Regular Navy and Naval Reserve who are not restricted in the performance of duty. Unrestricted Line Officers are the officers who advance to become Admirals and command Naval ships and battle groups. Designators (jobs) which fall into the Unrestricted Line Officer category are: Surface Warfare Officers, Pilots, Navy Flight Officers, Aviation Support Officers, Submarine Officers, SEALS, Divers and EOD Officers. These officers are commissioned through the Naval Academy, Officer Candidate School (OCS), and Reserve Officer Training Corps (ROTC). Restricted Line Officers are officers of the line of the Regular Navy and Naval Reserve who are restricted in the performance of duty by having been designated for aviation duty, engineering duty, aerospace engineering duty, or special duty. Examples are: Aviation Maintenance Officers, Specialists in Information / Cryptographic Support, Intelligence, Automatic Data Processing, Public Affairs, and Oceanography. As with Unrestricted Line Officers, these officers are also commissioned through OCS, the Naval Academy, or ROTC. Typically, it is a medical disqualification that prohibits an officer candidate to pursue unrestricted line through the Naval Academy or Naval ROTC and they must select restricted line or staff corps. However, officer candidates who apply through OCS may select restricted line options that are open to them regardless of medical disqualification for unrestricted line on an as needed basis by the Navy. The number designators associated with many of these jobs are: 1200 - Human Resources Officer, 1800 - Oceanography Officer, Intel Officer 1830, 1940 - Cyber Warfare Engineer. Those of the Staff Corps are specialists in career fields which are professions unto themselves, such as physicians, nurses, chaplains, lawyers, civil engineers, etc. Staff Corps officers wear their specialty insignia on the sleeve of the dress blue uniforms and on their shoulder boards in place of the star worn by Line officers. These officers are often commissioned through a special "mini-OCS" (5 weeks) or through ROTC. However, there are billets filled by the Naval Academy graduating class as well for high achieving Midshipmen seeking medical corps. However, most graduates from the Naval Academy select an unrestricted line designator after graduation and transfer into other communities in the unrestricted line or staff corps as well. There are many former Navy SEALs who are doctors and lawyers as well as pilots and submariners who become engineers or even chaplains. Typically after earning the designator warfare specialty (SEAL trident, Pilot wings, etc. ), the officer can apply for what is called the "lateral transfer" and move to another designator within the Navy. Some of the number designators associated with these jobs are: 2100 - Medical Officer, 2200 - Dental Officer, 2500 - JAG Corps, Supply Corps 3100, Chaplain Corps 4100. Limited Duty Officers (LDOs) are former enlisted sailors or warrant officers who are selected for a commission based on extensive training and experience in their enlisted rating (job) or warrant officer occupational field. The Limited Duty Officer does not have to have a college degree or greater like all the Unrestricted Line, Restricted Line, and Staff Officers. As the name implies, they are limited to performing their duties as commissioned officers within the field they are selected in. They are commissioned through the LDO Selection Program. Typically, they will not rank higher than Commander (O-5) nor will they become Commanding Officers. They are limited to Executive Officer as the highest command. However, there are some commands in the Navy that are considered Executive Officer tours like Commanding Officer of a Detachment on a foreign Allied base, or the CO of a smaller vessel in the Navy, for instance. The Limited Duty Officers are eligible for these Commanding Officer / Executive officer tours. Some of the number designators with these jobs are: 6110 / 6120 / 6130 (Surface), 6150 - SEAL. All officer jobs, assignments, and promotions are based on performance and needs of the Navy.